as a long time fan of the IT Cosmetics products i was so pumped to find this package on my doorstep a few weeks ago. included in the package were the five top selling IT Cosmetics products. after using them for a few weeks they have quickly become personal favorites. top of the list is the Brow Power pencil. this pencil is all kinds of AMAZING. it is the best color for pretty much all blonde/brown brows. it makes coloring in your brows so easy and the end has a spool on it for blending. i can pencil my brows in two seconds and they looks natural and gorgeous. i love how easy it is. 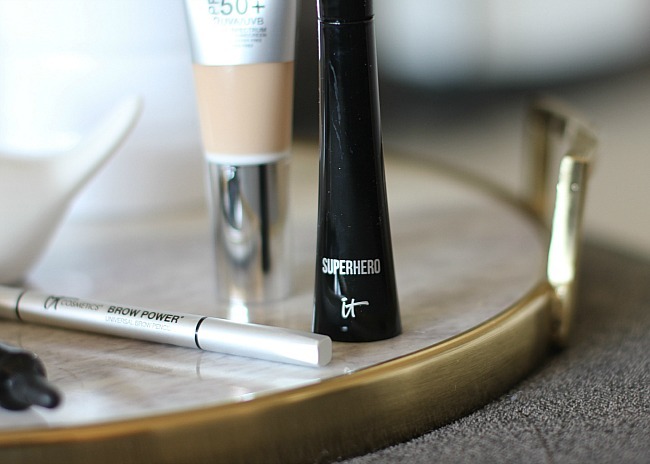 the Super Hero mascara is great for giving you that lash length you really want. i am a mascara junkie and this volumizing mascara 'stretches' your lashes to make them look longer and fuller. a definite must for your makeup arsenal. 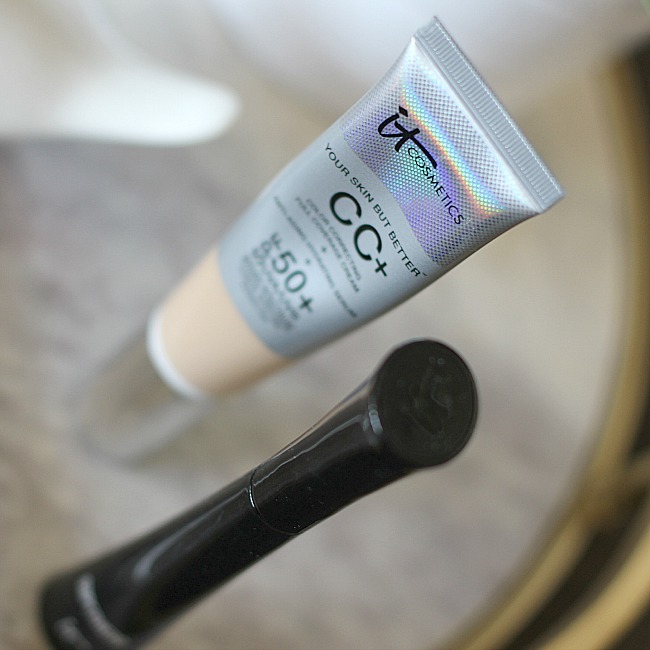 i love the IT Cosmetics CC cream particularly for summer when i am looking for that extra sunscreen coverage without compromising my skin. 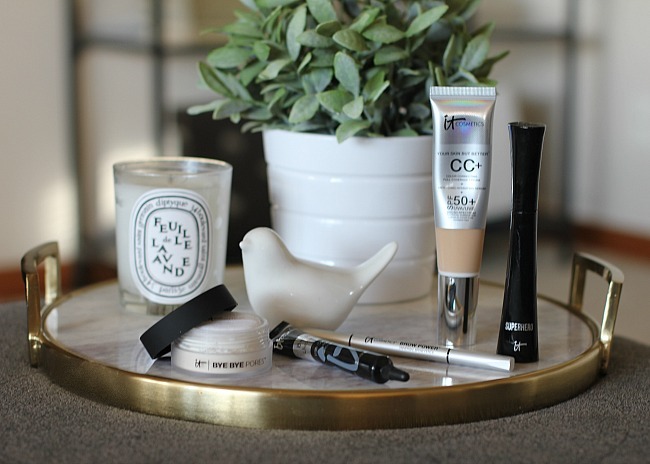 i like to wear this CC cream on its own for that bare skin look or i will layer it under my regular foundation for fuller coverage with sunscreen protection. plus the CC cream has so many added benefits for your skin you can't go wrong using it. 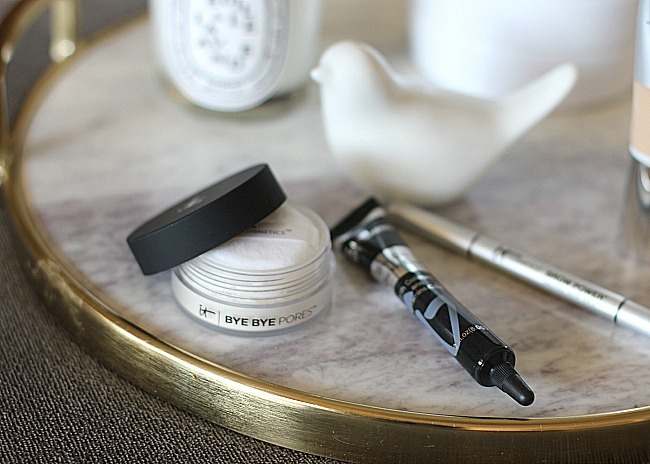 the Bye-Bye Under Eye Concealer is a great product for covering up those dark circles from pregnancy insomnia. it doesn't crack or crease and it lasts so long that you don't have to worry about it wearing off throughout the day. makes perfect sense why it is an award winning product. last but not least is the Bye Bye Pores invisible loose powder. a loose powder is a MUST for any makeup kit. it is always layered over my cream products whether it is foundation or concealer. it helps give you that smooth photo finish you want with your makeup and the Bye Bye Pores is no exception. it works wonders in giving you such a smooth finish. you can shop all the products using the widget below. let me know what your favorite IT Cosmetics product is.